Why is there an ethnic minority pay gap? Earlier this year, Theresa May pledged to address the gender pay gap and with a few businesses already drip feeding us their statistics, the public’s attention has now turned to the ethnic minority pay gap. Across the UK, particularly in the capital city, racial diversity is a problem as the majority of ethnic minority workers feel like they’ve hit a brick wall when it comes to pay and career progression. A report from the Equality and Human Rights Commission found that there was very little change of the ethnic minority pay gap during the period of 1993-2014 and if anything, the pay gaps have increased, particularly amongst men. Ethnic minority workers face a pay gap of up to 37% which shows clear discrimination in employment. Individuals with African and Asian surnames have to send twice as many CVs in to be invited for an interview, even though they hold the same qualifications as their fellow candidates. It has been found that black graduates earn an hourly rate of around £14.33 compared to white graduates who earned around £18.63, along with a 14% pay gap between the two workers with A levels. On top of this, ethnic minority graduates were 5-15% less likely to be employed six months after graduating and earned less if they were successful. Bangladeshi, Pakistani and black Africans are often segregated into low paid occupations, as ethnic minorities have high proportions of people who are being paid less than the living wage. For example, the pay gap for male Pakistanis is 31%, male black Africans is 17% and for British born black Caribbean males is 7%. There are several ways on how to respond to inequality in the work place, organisations have diverse recruit panels, ask for no names on CVs and provide their workforce with positive action training schemes. However, race equality needs to be prioritised and companies need to start enabling their own minority staff to progress. 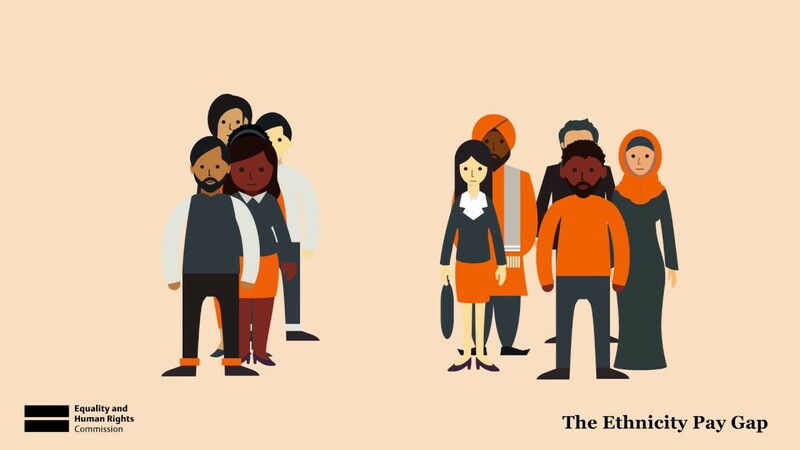 Until employers tackle unconscious bias and interpersonal discrimination, people of colour in London and across the UK will not have fair job opportunities and this can have a large impact on society. Along with the ethnic minority pay gap, there have been several findings on the lack of ethnic minority workers in senior roles. Just 1% of non-white police officers were found to be in senior roles, whilst a difference of 7% was found between non-white applicants and white applicants being shortlisted for jobs in the NHS. Those of a BAME background make up around 13% of the UK population, however, they clearly do not hold 13% of top highly paid jobs. This is another change Theresa May wants to put in place, she wants to focus on making sure the organisations in the UK and senior management teams reflect a diverse workplace. The ethnic minority pay gap report is set to be in place and will be carried out the same way as the gender pay gap; firms with at least 250 employees will be obliged to reveal their statistics.